Upper: The KS-47 G2 upper receiver is precision machined out of forged 7075 T6 aluminum, and then hard coat anodized for durability. While retaining the look of a standard M4 upper, the KS-47 G2 upper is designed to work with the new Gen2 KS-47 lower. The upper features integrated over-insertion tabs to prevent the bolt from dragging on the magazine. This CMV 4150 barrel is chambered in 7.62x39 with a 1 in 10 twist and has a single, large feed ramp to accommodate the larger case diameter of the 7.62x39 round. The barrel is nitride treated for accuracy and durability and is finished off with a 5/8-24 thread A2-style compensator. The forward assist, dust cover, charging handle, and safety are all standard AR-15, as are the PSA Classic Polymer Handguards. The KS-47 G2 upper will not work with a standard AR15 lower. Will the KS47 upper work on a mil-spec AR15 lower? BEST ANSWER: It will only work with the PSA KS47 lower. I have a gen1 KS47 lower will the gen2 KS47 upper fit and operate correctly on it? PSA has stated that these gen2s are compatible with gen1 parts but certain improvements may be negated. They failed to list what exactly would be affected. Anyone know what excatly would be affected by mixing parts? a search on this site for "sku # 7791110" turns up NOTHING! Projectile size varies from.308-.310 if I'm not mistaken. Question being is this upper safe to shoot Fiocchi ammo with .310 diameter ammo? Does this upper have a round or triangle handguard cap? Very impressed with the accuracy the milling on the upper is flawless and I love the medium weight profile on the barrel. Only ran 100rds through it so far with out one issue right out the box didn’t even oil it. Didn’t have one malfunction to speak of. I was shooting Tula fmj wolf performance sp and wolf military classic. Using a 1-8x I was quit surprised at the groups it shot with all the ammo but especially the military classic. Didn’t even have a stable rest down on one knee with the rifle rested across a 55gal drum it was easily stacking them in there 1.5’ groups at 85yds. I really think with a little polishing on the trigger and hammer this thing will definitely shoot under 1.5’ at 100yds all day. I have this mounted on the basic ks47 lower which doesn’t have a very good trigger topped with an unstable shooting position and cheap ammo I didn’t have a group worse than 2 inches. I will get it out this weekend at a full 100 200 an 300 yds then update this review. 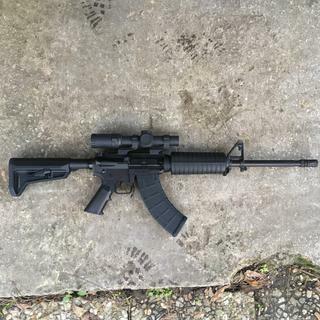 It’s definitely the most accurate 7.62x39 I’ve shot and I’m excited because it has the potential to do even better. I said when I ordered it I’d be happy with 2 moa needless to say I’m beyond happy with the performance. Can’t wait to get it back out it definitely lets you know your not shooting a 223. The only mods I’ve done so far are an ambi charging handle (I’m left handed) magpul moe handguard and I may end up putting in a brake. But you don’t even have to do that this thing is ready to rock out the box. 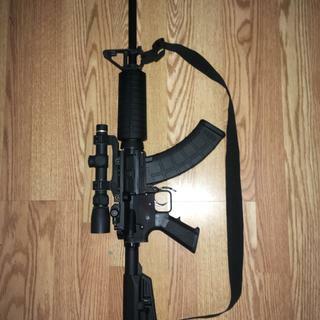 It may very well jump over my 14.5’ 223 and 16’ 6.5 Grendel as my go to rifle. My 7 year old son is going to love using this next deer season. So far so good I have put about 1000 rounds through this and I have been shooting wolf ammunition through it and I have had no problems with casings sticking in the chamber. The only problem I have had though is with light primer strikes so what I did was put the firing pin in a drill press and ground off 30 thousandths off of the part of the firing pin that strikes the bolt assembly. I think I ground off to much and next time I’ll do 10 thousandths at a time but since I did this I have had no light primer strikes and every round out of the last 500 have fired. 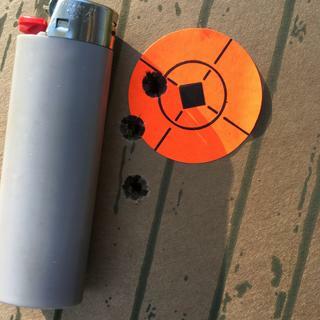 The accuracy is pretty good I have been shooting a 10x 10 steel plate at 200 yards and hitting it consistently.